When tissue fluid enters the small blind-ended lymphatic capillariesthat form a network between the cells it becomes lymph. Lymph is a clear watery fluid that is very similar to blood plasma except that it contains large numbers of white blood cells, mostly lymphocytes. It also contains protein, cellular debris, foreign particles and bacteria. Lymph that comes from the intestines also contains many fat globules following the absorption of fat from the digested food into the lymphatics (lacteals) of the villi (see chapter 11 for more on these). From the lymph capillaries the lymph flows into larger tubes called lymphatic vessels.These carry the lymph back to join the blood circulation (see diagrams 10.1 and 10.2). Lymphatic vessels have several similarities to veins. Both are thin walled and return fluid to the right hand side of the heart. The movement of the fluid in both is brought about by the contraction of the muscles that surround them and both have valves to prevent backflow. One important difference is that lymph passes through at least one lymph node or gland before it reaches the blood system (see diagram 10.2). These filter out used cell parts, cancer cells and bacteria and help defend the body from infection. 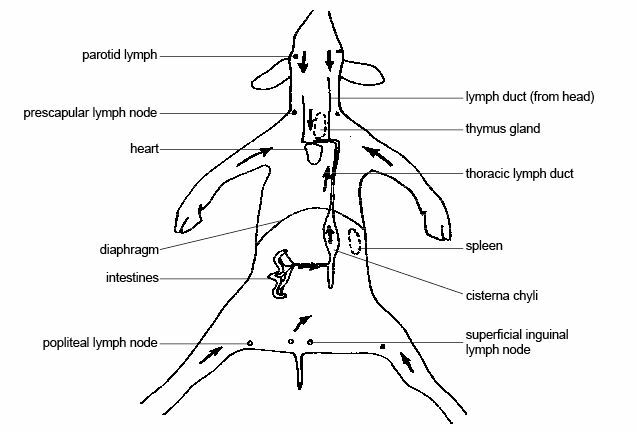 Lymph nodes are of various sizes and shapes and found throughout the body and the more important ones are shown in diagram 10.3. They consist of lymph tissue surrounded by a fibrous sheath. Lymph flows into them through a number of incoming vessels. It then trickles through small channels where white cells called macrophages (derived from monocytes) remove the bacteria and debris by engulfing and digesting them (see diagram 10.4). The lymph then leaves the lymph nodes through outgoing vessels to continue its journey towards the heart where it rejoins the blood circulation (see diagrams 10.2 and 10.3). As well as filtering the lymph, lymph nodes produce the white cells known as lymphocytes. Lymphocytes are also produced by the thymus, spleen and bone marrow. There are two kinds of lymphocyte. The first attack invading micro organisms directly while others produce antibodies that circulate in the blood and attack them. The function of the lymphatic system can therefore be summarized as transport and defense. It is important for returning the fluid and proteins that have escaped from the blood capillaries to the blood system and is also responsible for picking up the products of fat digestion in the small intestine. Its other essential function is as part of the immune system, defending the body against infection. During infection of the body the lymph nodes often become swollen and tender because of their increased activity. This is what causes the swollen ‘glands’ in your neck during throat infections, mumps and tonsillitis. Sometimes the bacteria multiply in the lymph node and cause inflammation. Cancer cells may also be carried to the lymph nodes and then transported to other parts of the body where they may multiply to form a secondary growth or metastasis. The lymphatic system may therefore contribute to the spread of cancer. Inactivity of the muscles surrounding the lymphatic vessels or blockage of these vessels causes tissue fluid to ‘back up’ in the tissues resulting in swelling or oedema.